Phytoplankton are autotrophic (meaning they make their own food) members of a group of organisms known as plankton and represent 90% of all marine plant life. The word phytoplankton comes from Greek, phyto meaning plant and plankton which means that it is made to wander or drift. They are microscopic organisms that can live in both salt or fresh water environments. They cannot be seen with the naked eye but can be seen in large colonies because of a green discolouration in the water due to large amounts of chlorophyll. They are divided into two main groups; photosynthetic cyanobacteria or unicellular algae. Phytoplankton is the base of the whole marine food chain, without it marine life would cease to exist. I don't have a fetish for algae but I do believe that phytoplankton will play a dominant role in shaping our future. 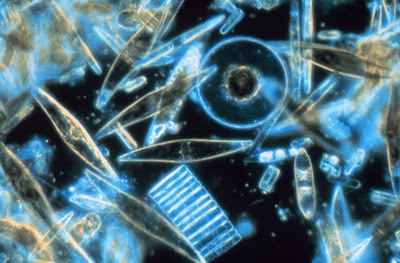 Phytoplankton contain chlorophyll and this enables them to trap vast amounts of carbon dioxide through photosynthesis. This is why the oceans are capable of significantly reducing the amount of carbon dioxide on our planet and are currently responsible for up to 50% of carbon fixation. The carbon dioxide is trapped in the phytoplankton because they build up a thick silica skeletal shell. When they die, they sink to the bottom and constant deposition of the sediments results in the phytoplankton becoming buried. This leads to the formation of crude oil over millions of years of compression. The carbon is also fixated when it is consumed by heterotrophic marine life and the small amount of carbon that is released in respiration is recycled once again by the phytoplankton. They account for approximately 1% of the earth's photosynthetic biomass but are responsible for producing more than 50% of atmospheric oxygen. Phytoplankton occupy the upper part of the sea or the sunlit area which is called the euphotic zone because of their need for light. They also need certain vitamins and minerals to survive such as iron. When the surface of the ocean is cold, the deeper parts of the ocean bring these nutrients to the surface and the plankton live. However, when the surface is warm it is less dense and therefore very little nutrients come up from the frigid deep because of the significant difference in density. This results in the death of the phytoplankton. This situation occurred in El Niño resulting in the death of much marine life. With global temperatures rising due to the Enhanced Greenhouse Effect, the population of phytoplankton is decreasing at an estimated rate of 1% per year. A recent survey published in the scientific journal Nature claimed that phytoplankton concentration on the ocean's surface has declined by 40% from 1950 most likely due to ocean warming. There is also great potential for utilising phytoplankton as a biofuel. According to research done by ExxonMobil, algae have a capability of producing 2,000 gallons of fuel per acre which is vast when compared to the meagre 600 gallons per acre produced by palm oil, currently one of the biggest biofuel sources. It has the advantage of being in the ocean where there is plenty of space unlike on land. The need for space is the dominating factor that is hindering large scale production of biofuels. This year Obama designated 14 million into algae research and ExxonMobil 600 million. It is a carbon neutral fuel because it absorbs the same amount of carbon dioxide in its growth as it emits when burnt as a fuel. Recently US plane was flown on a mixture traditional biofuels and algal biofuels. To conclude, phytoplankton is vital for human survival in the future and for our adaptation to a decreasing amount of fuel with surging prices. It benefits our planet, increasing our atmospheric oxygen and decreasing carbon dioxide. I think that phytoplankton is going to play a major part in the future and that this essay will be viewed as a turning point in the history of our glorious planet!! This article was written by Junior Frog Blog Reporter Hamish Law and was submitted for the St. Columba's Biology Prize.